Outfitted with a metallic Y stand and a narrow bezel, the UH750 31.5" 16:9 4K UHD LCD Monitor from Samsung offers an enhanced viewing experience with less distractions. The Samsung UH750 monitor features a 3840 x 2160 4K UHD resolution, a 3000:1 static contrast ratio, a 250 cd/m² brightness rating, a 1 ms response time, support for over 1.07 billion colors, and Samsung's Mega ∞ dynamic contrast ratio to produce darker dark and brighter light colors. Setup and configuration of this Samsung monitor is simple as it comes equipped with HDMI, DisplayPort, and Mini DisplayPort inputs as well as a USB 3.0 hub. Samsung has a variety of features designed to enhance the viewing experience including quantum dot technology and Picture-by-Picture functionality. Quantum dot technology, when coupled with the 1.07 billion supported colors, offers enhanced color representation including coverage of 125% of the sRGB color space. You can also divide up the screen using the Picture-by-Picture function to see projects, documents, and other content side-by-side, which greatly enhances workflow. With 4K UHD resolution, its wider workspace allows you to view more webpages, images, and texts without having to scroll or zoom. Blending quantum dots with one billion shades of color, the UH750 presents images vividly and accurately. With greens and reds refreshingly freed from desaturation, what you see on the screen simply comes alive. Samsung's Picture-by-Picture capabilities let you connect to two different devices at the same time while still maintaining the original image quality. The Picture-in-Picture feature also allows you to do away with the need for a second monitor even when you are multitasking. You can resize the second image up to 25% of the screen and position it anywhere you wish. With a slim-body, narrow bezel, a sleek back, and a metallic Y stand, the UH750 makes an urbane, modern accent to your home or office décor. With a 1 ms response time, you can see even the fastest on-screen motion clearly and smoothly without motion blur, judder, or ghosting. Box Dimensions (LxWxH) 33.0 x 20.0 x 10.0"
UH750 31.5" 16:9 4K UHD LCD Monitor is rated 3.6 out of 5 by 16. Rated 5 out of 5 by Jocoast from PERFECT Monitor for gaming!!! I have an Xbox One X and let me tell you guys this took my gaming to another level. Not only is it extremely fast as far as response time goes but the picture quality is AMAZING. So many vibrant and detailed colors. Perfect clarity. Best money I’ve ever spent! It’s also adjustable! From turning left or right and sliding the actual monitor UP or DOWN for a better eye level view. If you’re hesitant on what monitor to buy, I swear to you guys! This. IS. IT! Rated 5 out of 5 by LittleBiene777 from Truly Remarkable I have purchased the 32" version of the UH750 primarily for the Xbox One X and the UH750 blew my expectations. The level of detail in games are unbelievable, everything is crisp and clear and the colors are so vibrant. If you are in market for a 4K monitor... this is the monitor for you. This monitor also has Picture in Picture and Picture by Picture for all those who love to multitask and need to get work done. Rated 5 out of 5 by Invincible19 from Amazing features colors and brightness on this monitor are superior. Especially, the Black levels with almost no light bleed what so ever and a lot better than most 4K monitors out there on the market. Viewing angles are great. V stand is a little wobbly but barely noticeable when playing games or just typing. But of course, the 4K looks amazing. Rated 3 out of 5 by Irfan from Stick with IPS panel for color reproduction and sharpness Currently I use IPS panel and have been very happy with it. I bought this monitor for my son for his college. I am quite disappointed by both its color reproduction and sharpness. MY IPS monitor produces 100% of sRGB where this monitor is speced for 125% of sRGB. Yet, I get deeper reds and range of other colors on my IPS display than this one. For sharpness I never expected Samsung ITN display to be as good as IPS but for this monitor sharpness compares with monitor costing much less than this monitor.? I would highly recommend to stick with IPS panel. If primary goal is games, this monitor is ok. Rated 5 out of 5 by LETSGOFLYERS from Great monitor! After about 6 years of using my Samsung SycMaster 2693HM I decided to upgrade. I love this Monitor. Great picture and nice color! I have always used Samsung monitors and loved each and every on of them. Rated 1 out of 5 by tarunjoshi2603 from The power cable is not even holding in The power cable is not even holding in , leave alone be able to see the video . this is the day 0 experience they want to give. The shape of the rear socket says a lot that they haven't worked in this product's delivery. Single pin power cord that too vertical insertion,seriously Samsung ??? Does this monitor have AMD FreeSync? 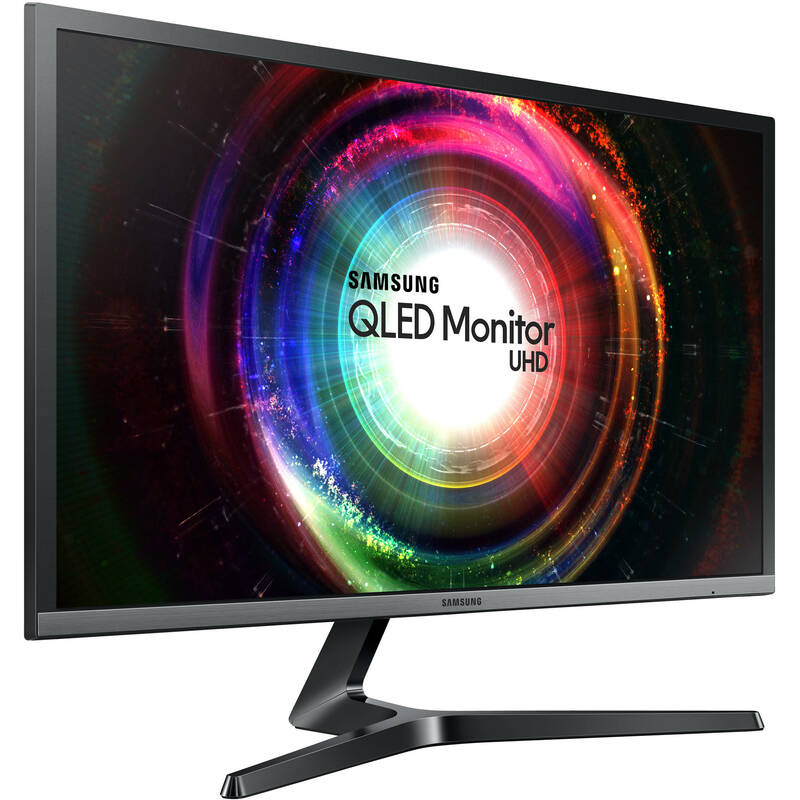 The Samsung UH750 31.5 16:9 4K UHD LCD Monitor B&amp;H # SAUH750 supports AMD's Freesync.